Helen L. “Mick” Nelson passed away on Friday evening March 9, 2018, at the St. Joseph Regional Medical Center, Plymouth. She was born Jan. 2, 1931, the seventh child of Walter John and Stella May (Fletcher) Nelson, in her parent’s home in Plymouth. When she was a little girl, her sister, Mary, used to call her Mickey Mouse. When she started school, it eventually changed to just Mick. She graduated from Plymouth High School with the class of 1950, and was active in: band, senior year president, orchestra, choir, GAA, Sunshine Club, Ye Pilgrim, senior year editor and secretary and president of 4-H and Junior Leaders. She attended Evangelical United Methodist Church, where she sang in the choir, directed the children’s choir and served as Sunday school secretary. She later joined First Presbyterian Church and served as an Elder and Deacon. She was in the choir, taught Sunday school class and was the editor of the church newsletter and chairman of the worship committee since 1999. Recently she became a member of Trinity United Methodist Church where her family attends. She worked for short time at Montgomery Wards, Bosworths and Associates in South Bend. 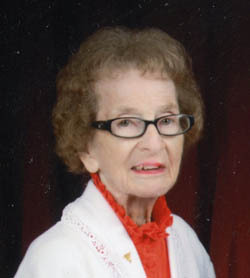 She started working for Fred Morrow Insurance Agency in 1957 and retired in 1987. In 1992, she went to work for Mayor Jack Greenlee as secretary during his two terms in office. She was a member and served on many clubs, including Business and Professional Women’s Club, Speech Craft for Women, Delta Theta Tau Sorority, the Alumnae Chapter and Miss Plymouth Pageant Committee. She served on the Blueberry Festival board and in 2006, was honored as one of the parade marshals for the 40th Anniversary of the festival. She was a member of the Hospital Auxiliary and Big Red Booster Club and held season tickets of Plymouth Basketball since being in 5th grade. She loved to bake and often gave them to offices and people who had been especially nice to her. Family was the most important part of her life. She never missed sending cards and gifts for birthdays, anniversaries and other special occasions. She is survived by 18 nieces and nephews, 31 great nieces and nephews, and 41 great-great nieces and nephews, as well as her sisters, Joan Wolff and Rosemarie Campbell, and sister-in-law, Darlene Brundige. She was preceded in death by her parents, brothers, Wayne, Jim, Gordon and Wendell, sister, Mary Girten, and niece, Jane Girten, brothers-in-law, Ernie Campbell, Harry Girten and Fred Wolff, and sisters-in-law Mildred Nelson and Treva Nelson. Visitation will be held from 4-7 p.m. on Tuesday, March 13, 2018, in the Johnson-Danielson Funeral Home, 1100 North Michigan Street, Plymouth, concluding with a Delta Theta Tau memorial service. Funeral services will be held at 11 a.m. on Wednesday, March 14, 2018, at the funeral home with Rev. Bob Land and Rev. Les Johnson officiating. Burial will be in the Oak Hill Cemetery.